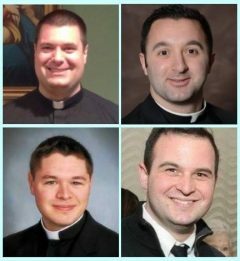 Father Tom Whittingham, Father Steve Isaac (top l-r), along with Father Matt Brody and Deacon Eric Banecker (bottom l-r) will field questions at “Stump the Priest!” on Nov. 14. Metanoia Young Adults will host its first “Stump the Priest” night on Tuesday, Nov. 14 at 7 p.m. The evening will be an open Q&A session for Catholic young adults (18-39 years old), during which a panel of three priests and one deacon will answer faith-related questions from the crowd. Panelists will include Father Tom Whittingham (St. Katharine Drexel Parish, Chester), Father Steve Isaac (St. Ignatius Loyola, Sinking Spring), Father Matt Brody (Ss. Peter and Paul, West Chester) and Deacon Eric Banecker (Mary Mother of the Redeemer, North Wales). The event will take place in the Fellowship Cafe at Sacred Heart Catholic Church, located at 838 Walnut Street in Royersford. Parking is free, and there will be a Metanoia sign by the entrance to the cafe. Snacks and refreshments will be provided. Doors open at 7:00 p.m., and the session will begin at 7:30 p.m.
Tough questions are welcomed. Participants can submit their inquiries anonymously at http://metanoiayoungadults.weebly.com/stump-the-priest.html.